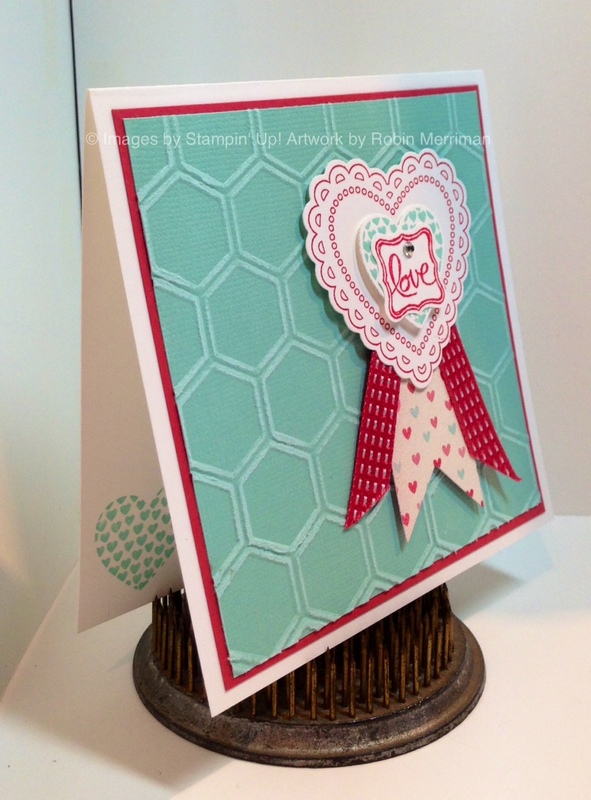 Welcome to stop #12 on the Remarkable Stampers Blog Tour! I know Anne had some gorgeous artwork for you! Here are my offerings for you today. 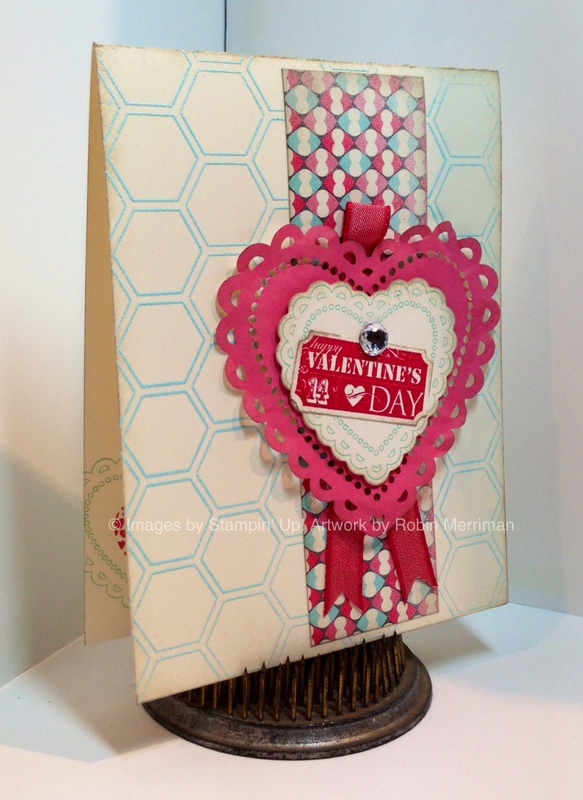 I actually have three cards created with the Hearts - A- Flutter stamp set. It's an incredibly versatile set and our blog tour, I know, has only scratched the surface of all you can create with it. 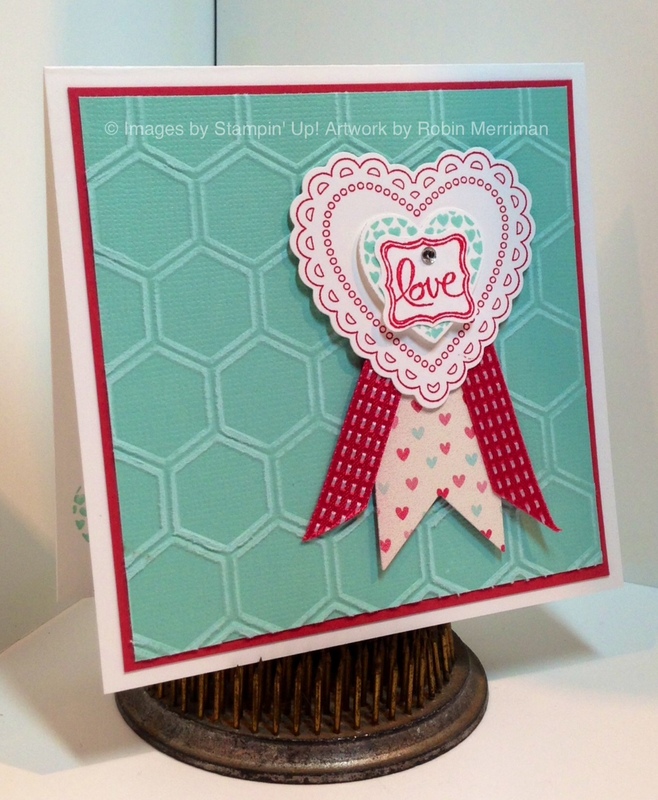 The frilly heart stamp is at the center of the focal point on this one. I stamped it in Pool Party ink on Very Vanilla cardstock to match the card base. It's cut out using the Hearts - A - Flutter Framelits then sponged with Crumb Cake ink. I added the greeting from the Take a Ticket stamp set. Stamped in Real Red then punched out with the Ticket Punch. I sponged it as well, then glued it to the heart with Tombow and added a New Large Rhinestone Jewel. That heart element is popped up on a heart that I cut out of the More Amore Designer Series Paper that has a piece of Real Red Taffeta Ribbon behind it. More of the Designer paper are behind it and everything is mounted on the Very Vanilla card base. I did something unique here - I covered the inside of the New Honeycomb embossing folder with Versamark ink then placed the cardstock inside, transferring the ink to the cardstock without running it through my Big Shot. Next, I heat embossed it with the New Pool Party embossing powder, creating a different look with our embossing folder. See the sweet little stamped accent on the inside corner? I stamped the frilly heart again then stamped the heart full of hearts inside that. This one was done with Whisper White, Primrose Petals, Pool Party and Real Red. I ran the Pool Party Co'ordinations cardstock through my Big Shot with the Honeycomb embossing folder, sanding the raised impression when it was done. The frilly heart was stamped in Primrose Petals, then cut out with the Framelits again. I stamped the heart of hearts in Pool Party and cut that out with the Framelits also. It's popped up on the frilly heart with a Stampin' Dimensional. The little "love" greeting is from the Ciao Baby stamp set, stamped in Real Red and punched out with the Petite Label Punch. I added a little Rhinestone to accent it. The little banner accents were made with a piece of More Amore Designer Series paper and a piece of Primrose Petals Stitched Satin Ribbon. See the little stamped heart on the inside? 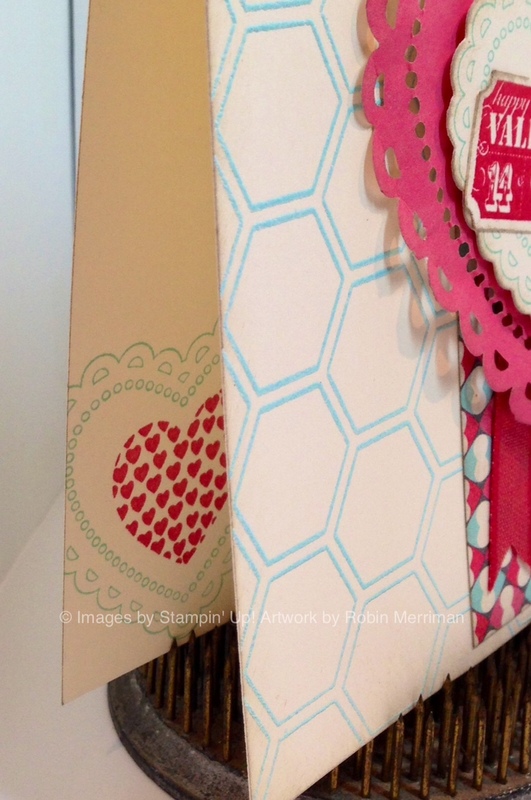 I just love stamping on the inside of my cards - don't you? I wanted to go completely outside of the box on this one so I pulled out some Basic Gray cardstock along with some Naturals White and got started. 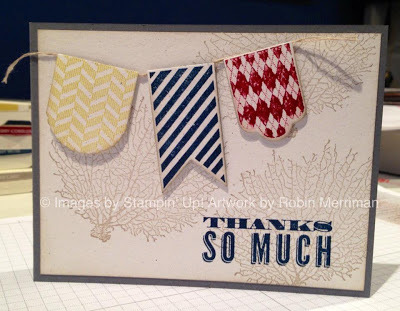 There are actually 4 stamp sets used on this card: By the Tide for the sea fan background, Oh, Hello for the greeting, Beyond Plaid for the Summer Starfruit and Raspberry Ripple flags and our featured set for the flag in the middle. A little Linen Thread holds the nautical feeling banner together and the individual flags are mounted on Stampin' Dimensionals. All the flags were cut out with the Hearts - A- Flutter Framelits and were sponged with Crumb Cake ink. 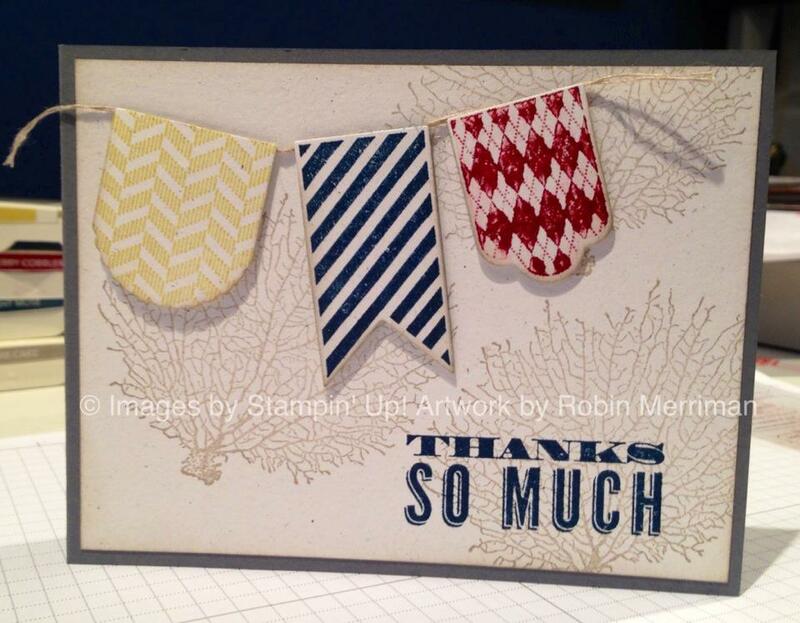 The greeting and striped flag were stamped with Midnight Muse ink and the sea fan is in Crumb Cake. The Raspberry Ripple flag is actually stamped with two stamps - the solid flag from Hearts - A -Flutter and the argyle plaid from Beyond Plaid. I used the Kissing technique to achieve the look shown here. Have fun over there and be sure to check out all 15 of the stops on the tour before you go! Stamped blessings to you all! LOVE these cards--I got the framelits but wasn't sure I needed the stamps or the paper. I'm definitely rethinking that now. Thanks for sharing!